With today’s smart devices, our lives are more connected than ever before, whether it’s with our families and loved ones within our homes or with millions of others across different time zones. Expanded data services providing high-quality content and real-time streaming, as well as the upcoming 5G era on the horizon, will require even faster and more accurate data transfer among our devices. Their processing power, of course, must also come as a given. Samsung has made continuous advancements in connectivity technologies with the first commercial application of LTE technology in modems in 2009, first one-gigabit-per-second (Gbps) modem with 5CA (Carrier Aggregation) in 2016, and first 1.2Gbps modem with 6CA in 2017. With 1.2Gbps, the download of a two-hour-long HD movie on a mobile device can be completed in just ten seconds. This type of ongoing innovation in connectivity will serve as the foundation to bring people closer together through future applications such as the Internet of Things (IoT), automotive and so on. Owing to the recent trends, demand for such connectivity capabilities in mobile devices have seen tremendous growth, and required a delicate combination with a device’s processing power. Samsung’s family of branded application processors (AP), the Exynos series, has demonstrated industry-leading performance in global flagship devices over the years. The family of APs was the first to introduce a slew of innovations in chipsets such as the big.LITTLE architecture and the 14- and 10-nanometer process technologies that have elevated our mobile experiences and equipped us to do more. In 2015, Exynos chipsets with connectivity functionalities finally became available in a single-chip solution, providing device manufacturers with more flexibility in design and efficiency. While Samsung’s advancements in LTE technologies have paved the way to support carriers and smartphone manufacturers with voice calling features, the missing piece of the puzzle for us, in spite of Exynos’ proven track record, was CDMA (Code Division Multiple Access). Without the support of the major radio technology system used in mobile devices, we had limitations in providing our latest technology to certain regions that requires related network specifications. As part of an effort to tighten our edge in connectivity offerings, we incorporated the modem development team previously at one of Samsung’s research centers, under the System LSI Business’ roof in 2014. The move paid off. 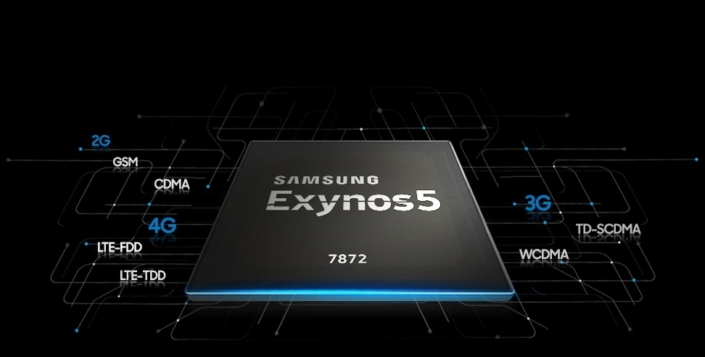 With the recent launch of Exynos 7872, the Exynos System-on-Chips (SoC) can currently support all six communication standards in the market (CDMA, GSM, TD-SCDMA, WCDMA, LTE-FDD, LTE-TDD) to meet the needs of devices across various segments. The added boost has naturally led to an active engagement with global mobile manufacturers that will allow more consumers to choose smart devices with the benefits of Exynos SoCs. The possibilities and expectations for 5G excite us, and Exynos, armed with next-generation connectivity technologies, will continue to be a crucial part of this breakthrough moment. As we prepare for the major changes to come, Samsung plans to build on its development capabilities and expand collaboration with global partners to bring about powerful and connected SoC solutions for tomorrow.